Septimus: I am sorry that the seed fell on stony ground. Thomasina: That was the sin of Onan, wasn't it, Septimus? Septimus: Yes. He was giving his brother's wife a Latin lesson and she was hardly the wiser after it than before. A few months ago, I spent the evening in Baltimore attending a production of a play called Church. 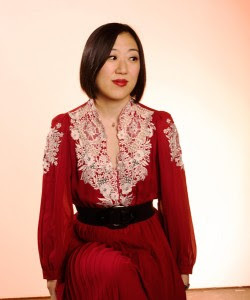 The New York playwright, Young Jean Lee, grew up the daughter of Korean immigrants who were devout Evangelical Christians. Like most teenagers, she rebelled against the world she knew with the onset of adolescence and young adulthood; her rebellion consisted of strident atheism. A little older and wiser, Young Jean Lee entered a stage in her life where animosity towards her former faith subsided and she started reflecting on her formative years with greater complexity. Church represents her attempt to look at Christianity and spirituality with new eyes. She remains an atheist, but wanted to explore what Christian church services are for the people who attend them, what they can or could be for people who don't. So in her play, the church in Church is for an imagined congregation, the very type of faithful community one might expect to find attending a small NYC avant garde theatre piece called "Church": artsy, left-leaning, atheist/agnostic types who primarily interact with religiousity by mocking it and the people who observe it. 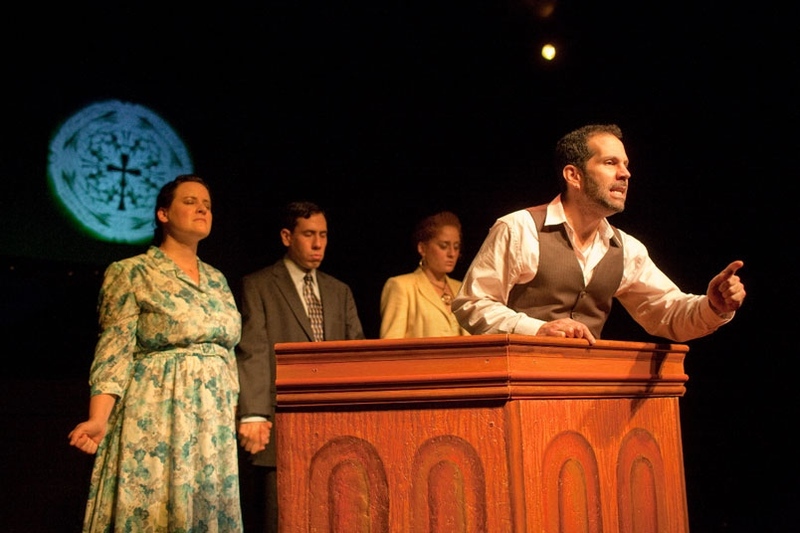 Imagine what a church service would be like for "those type of people," complete with sermons that are designed to call you to repentance and you'll begin to understand what Young Jean Lee is doing with this play. To give you an example that's more concrete, I'd like to explain the portion of the show which was committed to the dance ministry. It illustrates the ambivalent stance the production requires. Most of the show consisted of a single actor delivering sermons; however, there were also three other members of the worship team who would participate with the audience in different ways. Their interactions were more testimonial. Towards the end of the show, those three began an enthusiastic dance which I--someone interested in studying Evangelical and charismatic Christianity--immediately recognized as a contemporary form of worship found in many Christian churches. It was, in the first few minutes, a matter of recognizing the signification: the production was representing, indexing, or pointing to a style of worship. It was showcasing, "this is one of the things that Christians do in church." But it lasted longer than a few minutes. After a while, though very little changed in terms of movement, the prolonged duration began to shift the portrayal from representation to parody. Because it continued beyond the traditional amount of time generally given to dance worship, the very medium of dancing as a form of spiritual expression began to look ridiculous and a bit silly. It had become exactly what one might have expected from the show: it turned the dance into a sideshow freak for the audience to gawk at. And then something powerful happened: it kept going. Whereas the prolonged duration of the dance initially highlighted the oddity of dance ministries, the fact that the dance kept going eventually allowed the actors to take the performance into a ritualized expression of faith and awe. It was a beautiful moment of such stillness and transcendence. It did not negate the humor felt previously, but it put it in a different perspective. Yes, Christian dance ministry is ostensibly silly from the outside; however, there remains a powerful embodiment in that very mode of performance and worship. It revealed how ritualized and potent dance ministries can be for the people who participate in them and for those who are audiences to such forms of worship. It was part of one of the most spiritual experiences I had last year. Church was not satirizing religion in the easily digestible form presented by someone like Stephen Colbert (which, don't get me wrong, I adore); Church presented a complicated relationship to religion--not parodying Christianity, but rather performing the various modes of Christian worship in order to appropriate its rich tradition for an agenda generally seen as antithetical to contemporary Christianity. What exactly can artsy, left-leaning, atheist/agnostic people do with Christianity? Just make fun of it? After a while, the joke runs stale and ultimately is downright mean-spirited. So Young Jean Lee asks, as a person who can never really abandon her Christian identity no matter how much she no longer believes in it, what are "we" as a community (specifically the type of people that would go to a production like Church) going to do in response to the fact that "we" coexist with Christians of many shades? Not everything about this production worked. That projection in the background of this photo was god-awful as a decision. It would glow at weird intervals and change colors in a very distracting way. But this man was awesome. I'd listen to his sermons anytime. 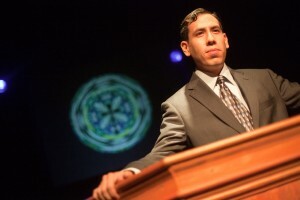 The reason I've spent so much time describing the production is to frame one of the sermons that particularly touched me as a young graduate student in the midst of academia and as a Mormon in the process of what some members of the uncorrelated Mormon community call a "faith transition." The main pastor presented a wonderful message which called me to repentance; and it was a call I wanted to answer and which ultimately encouraged my faith. His sermon railed against what he called "Masturbatory Rage." Basically, he used masturbation as a metaphor to describe how artsy, left-leaning, atheist/agnostic types tend to respond to politics and people which are in opposition to their own principles and agendas. "We" tend to work ourselves up by discussing how wrong non-artistic, right-leaning, religious individuals are ignorant or uninformed. They are oppressive and do not understand how things really are or They are greedy and selfish. They don't care about their fellow man. We spend time creating art which blasts their sensibilities and moralities, to violently push them out of the comfort zones they've built themselves into, congratulating ourselves for a job well done. If they don't respond to the truth we're presenting to them, then they are just perpetuating their own ignorance. We take pleasure in the creation of art that we convince ourselves is serving political purposes when really it is only talking to our little community, firing up our righteous indignation, stroking our egos, and culminating in a self-satisfying but ultimately unproductive climax of emotion, primarily rage. I love that metaphor; it has stuck with me since that night. Masturbation is a beautiful description for particular types of rage because it is not an empty or meaningless experience. It is a process predicated on pleasure and generally is completed with a physical manifestation or experience of fulfillment, joy, or relief. It is an act of creation in that it creates that particular experience. I frame it in this way because I don't think that the art or the rage that people participate in is hollow; there is something present. But in a larger scope, one which takes into consideration the communities outside our own, it is literally unproductive and not reproductive. Whether one thinks about sexuality in acts of hetero- or homosexual terms, those acts require at least two people. It consists of exchange, negotiation, reciprocation, and communication (and yes this is assuming a model of comparable equality and consent between participants). And in heterosexual interactions, pregnancy--the generation of new life--is a possible outcome. When our art or our discussions are productive, it requires acknowledgement of and cooperation with an autonomous individual or group whose ideas and sentiments are separate from our own. Sometimes principles clash and are in direct opposition. But if either side actually intends to create ideas, a possibility, or a future where life can continue, they need to stop retreating to their respective corners, masturbating, and congratulating themselves on their (self)righteousness. At the time I first saw Church, this resonated with how I felt about academia and my program. I needed to open my eyes to different opinions and arguments which were not my own--really consider how an oppositional point of view could prove valuable and strengthen my own convictions. However, since October, I have found that this sentiment has had a lot more to do with my position with my faith and the greater institution of The Church of Jesus Christ of Latter-day Saints. Yes, I find that I disagree with a number of policies and politics of the church; but for me--and I cannot stress how much I am speaking only for myself--the venom I was harboring, while I think justified, was not beneficial. It was unproductive and self-congratulatory rage; in other words, a carnal pleasure that did not help anyone. It did not serve other people who share similar frustrations as me. It did not seek to express those ideas to people who share opposite opinions thereby letting them know that there are other ways of thinking. Most importantly, it did not seek after a humility which balances personal conviction with a desire to more fully understand the truth that others possess. My rage has been satisfying and fulfilling, but has meant nothing to anyone else . . . and in a way, not much to me. I seek for a more thoughtful and nuanced relationship not only with my faith but also with the institution which administers aspects of that faith. Young Jean Lee's Church resonates with me, not only because it called me to repentance in a way that I greatly appreciated, but because it serves as a model of negotiation that mirrors my hopes. I might see some things as frustrating or downright silly in their practice, things that might make me want to laugh because with distance from the belief or practice it just looks ridiculous. But I want to keep looking, allow this dance to continue, that I might see the transcendence available to others through those things. That I might appreciate more sincerely it and them. That I might see Christianity and Mormonism themselves as new creatures in Christ. That I might be reborn as well. And that we might all know a joy, struggle, frustration, and ecstasy that is productive for ourselves, our communities, and the rising generations. That continues to be my hope. I like the Mormon Matters/Mormon Stories communities for that reason, that they create a forum for that kind of dialogue. But even then there's a tendency for discussion to devolve into self-congratulatory back-slapping and casual dismissiveness of dissent. That's probably amplified by the anonymity and nastiness of the internet in general, but it's pretty much a fixture in any community oriented around common principles (which I suppose is another way of saying "any community"). I think this is a basic human thing - our brains release endorphins when we hear things we agree with and it literally gives us pleasure. Among self-proclaimed liberals, though, for whom open-mindedness and empathy are professed articles of faith, there's a special kind of hypocrisy that manifests itself. We often fail to notice it until it runs counter to our personal beliefs (sort of like my post noting my disappointment with how Mormons are portrayed in the media). As for the church specifically, it's that dilemma between the faith and the institution that makes up most of the spiritual friction that I feel. And while it's easy to revel in the gratification that comes from mocking yet another sacrament meeting talk that says white shirts=spirituality (presented, of course as "white shirts don't correlate to spirituality, but I'm going to give an example that shows they actually do,", and yes, that happened this morning), the fact that that's the only part of the talk I remember says as much about where my priorities and spiritual state were as the speaker's. Did they talk about faith or charity? Hell if I know, they said something I disagreed with! Grr, how dare they! The same goes for the temple liturgy: I've had sessions absolutely ruined for me because I couldn't get past what I regard as the deep, heartlessly sexist aspects that make up a small part of the ceremony. Not that I should necessarily ignore or minimize those feelings, though most Mormons might think I'm overreacting. Actually, negotiating the proper response is fairly difficult. But I continue to attend the temple because I see a net positive spiritual boost - to borrow your metaphor, the dance as a whole is quite beautiful. Some people respond so negatively that they choose not to attend, which is fine if it works for them, but I continue to go, and I do myself a disservice if I let that little negativity overwhelm everything else. Might as well not go in that case. So yeah, this is a comment and not a post and therefore I don't feel obligated to sum up my thoughts coherently, plus it's Disney time and that demands the laptop. So excellent post, very insightful! Go dance your dance.